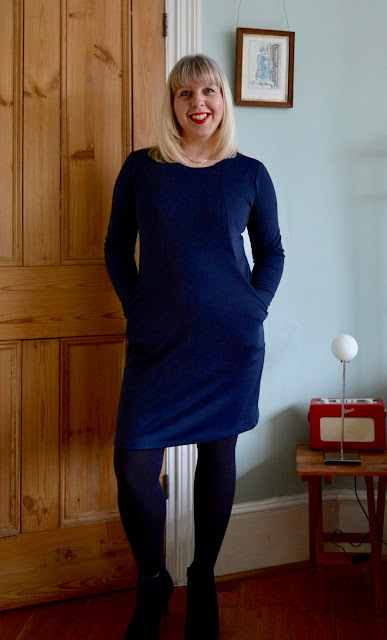 This is the Heather dress from Sew Over It, the first completed pattern from my #2017makenine list and my new favourite thing! It's a chic little number, with interesting curved seams (great for colour blocking) and fab oversized pockets. What's not to like?! Size-wise I cut a size 10, grading out to a size 12 at the bust on the front side panels. 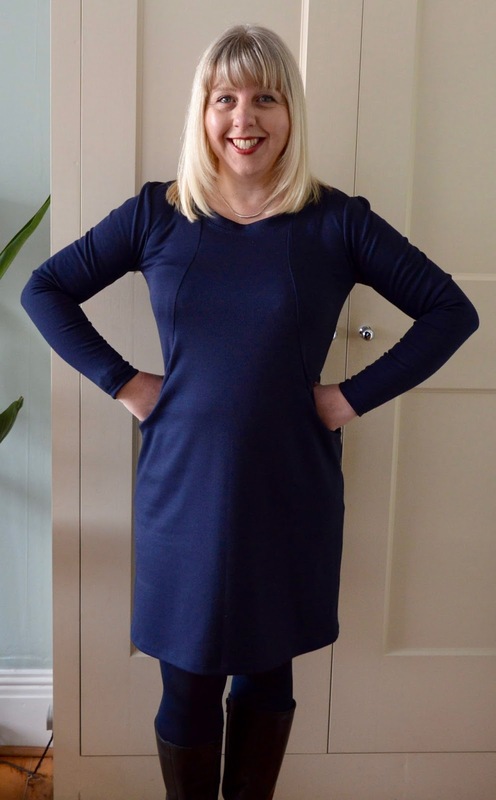 The only other changes I made to the pattern were to shorten the hem by two inches and shorten the sleeves by an inch, both of which are standard adjustments for me. The fit is exactly what I was hoping for - it's a reasonably tight fit with just enough ease to make it comfortable to wear. The pockets are really cosy too. There are no instructions to stabilise the shoulder seams, but I stabilised mine with twill tape to cope with the weight of the dress. All construction steps are illustrated with photos, making this a nice, straight forward sew. The only area where I puzzled for a minute was the pockets. Just remember that you're attaching the pocket bags to the front side seams, not the side seams as you normally would. Once I'd got my head round that, the dress came together very quickly - I think I sewed the whole thing in one afternoon. Mine is the Davy dress by Sewaholic I have 3 of them so far! The Heather dress is on my sewing list for this month just have to find the right fabric! It looks great and super comfy. Really suits you. I've never sewn a knit dress, but did buy the Heather pattern in the recent SOI sale. The length of ponte in my stash has a fine stripe which I don't matching so I'll be on the lookout for something plain. Really like this on you. Perfect combo of smart casual chic. And love the colour. It looks lovely in Navy! What a great start to the year. You look fab. I have stuck the PDF together today and am now puzzling out how much to lengthen by and how best to grade the pattern for my big bum and thighs. This dress is great on you. I love that shade. I'm wondering if I would suit this style - I'm very tempted but like ShelleyLou would have to lengthen and grade. Jane, this looks smashing! The fabric and pattern are a great match. You said you used ponte roma, and I think that is generally a lighter weight than straight ponte. Is that your take as well? I think a heavier ponte might not drape as well. I am going to have to get this pattern! Very beautiful. How much fabric did it use? It looks great on you Jane. I resolved to face my fear of PDF patterns this year, and last night I printed out the Heather dress and the Toaster sweater versions 1 and 2. Just need to stick them together and you've encouraged me to make the Heather dress first! I really like that color on you. You must look good in all the jewel tones. I wish the pattern came with a copyshop file. I just can't deal with all the taping anymore, although I love the dress. Looks lovely, I too have made this dress, the jersey that I used was a bit thick and the sizing was a bit big! I should have measured myself better? It's sitting waiting to be hemmed..... I will finish it and try with Ponte next time!